start to the day if nothing else. 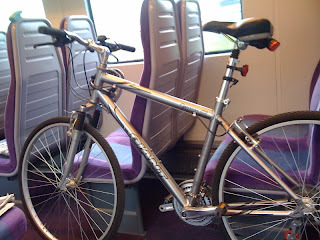 so you are one of those annoying people that block train seats with their bike rather than leave the bike by the train door! I was the only passenger in the carriage at 6:30 this morning and it had an extra wide aisle, so wasn't blocking anyone. Thought it better than blocking one of the doors.